UNCOOL: Mad Men S5 E6 Far Away Places | Everything is cool. My limited web information-gathering has led me to the conclusion that everyone loved this episode. Oh well: I was underwhelmed. This was the kind of episode that to me screams This!Is!Art!, which certainly can work sometimes—it was moody, beautifully staged and shot; but in my eyes it was cold at the center. First, the good: the LSD trip with Roger and Jane managed to avoid typical psychedelic drug cliches at every turn and was one of the most beautiful and moving portraits of the end of love I’ve seen. A positive portrayal of drug-use on tv? What does Matthew Weiner have on the AMC execs? In any case, I could have watched it for the whole hour. * If Baby Ginsberg did wind up in a Swedish orphanage, which I can imagine, is it at all likely he would have been adopted by Jews? I didn’t think that was the case for the most part. But I’ll let those more knowledgeable about the era (cough cough LDS) comment. Is it me, or do you just not care so much? About Peggy, about Don, about the agency…break up, stay together, lose the account, whatever. 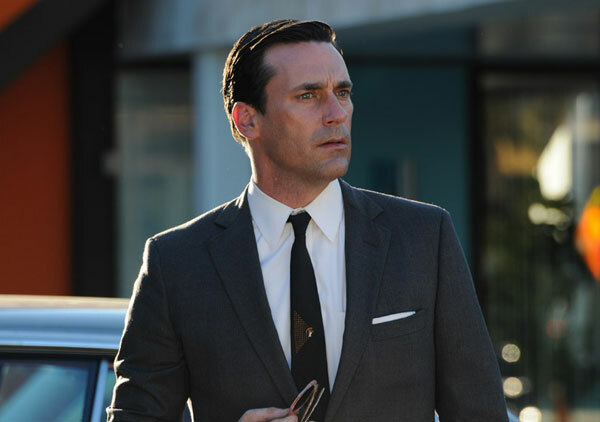 The fundamental problem with this season of Mad Men, I believe, is that nothing seems to be at stake. In past seasons, we always seemed to be teetering on the edge of disaster: will Don’s past be discovered?! Will the agency lose Lucky Strike?! This season, I feel that we’re not given any real reason to care whether Peggy screws up the Heinz account, or splits up with her boyfriend; whether Don and Megan make it, or how Megan feels about her work. The saddest part is that I see how there could be so much more dramatic tension: if Don’s slacking off at work led others in the agency to conspire to try to oust him from creative; or if Peggy had a promotion / raise pending on how good the Heinz account turned out—so she’d be lobbying for something creative, to show off her work, and the old-fashioned Heinz-guy would be working against her, driving her mad. In the end, it comes down to this: what’s the season arc? What menaces lurk on the horizon? It’s hard to avoid the conclusion that Mad Men is running out of steam, or coasting on previous successes. But I really want it to make me care again. ← UNCOOL: Support for Bieber reaches deathly level.